This past saturday marked my return to racing. 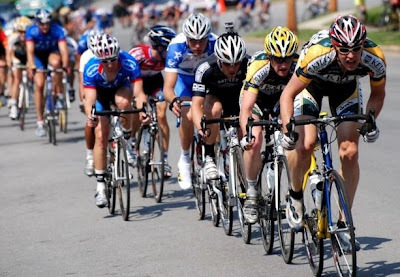 It was the district championship crit in Hagerstown. The course was fantastic, one technical turn, a short rise, and a headwind/false-flat drag to the line made me feel like I was back in the midwest for the summer long crit fest that is racing in the Chicago area. The plan was to keep things together so that our sprinter Shane Kline could go for the win. Things were aggressive early and we had one or two guys sitting on every move. My job was to chaperone Shane and help him move up if needed. Additionally I would lend an hand if tings got messy up front. Here is a shot of me bringing Clay across to a break midway thru the race. I look a bit chubby, and am suffering into the headwind. Late in the race two Harleys and Ramon rolled off unmarked. The gap was opening and I tried to drag Rick across. I got within a few seconds, but could not get there. Fortunately Rick is a hoss and was able to make the junction. The bad news that along with Rick, I took two guys from the teams already up the road leaving Rick to do battle with three Harleys and two Artemis guys. Yet again, we ended up stacking the odds against one of our best riders. Rick managed to get 4th place which is nothing short of superhuman. Shane did his job and took the field sprint for 7th. Rick used to race pro for Navigators, and though that was a few years back he still shows that most pros are a notch above even the best amateurs. 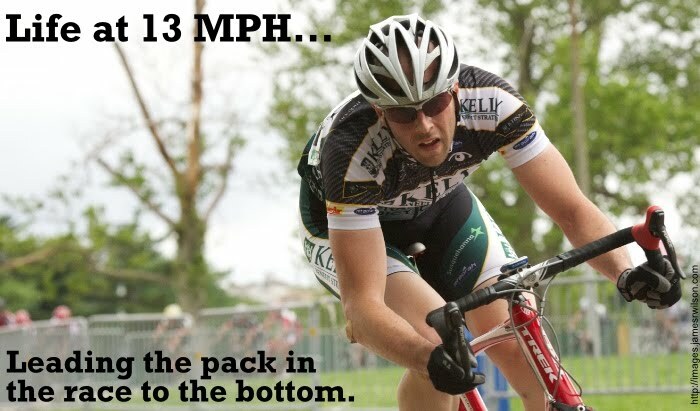 A prime example of this occurred at the Cascade Cycling Classic this past weekend. Yes, that is Chris Horner giving another rider a "lift" to the mountain top finish. Click here to see more photos and a description of the above event. I think my favorite picture is the shot with another group coming to the finish. I'd be pissed to find out that someone literally carried another rider up the climb and handily beat me.